It absolutely boggles my mind to say it out loud, but I go back to work a week from today. I have no idea where my maternity leave and the first twelve weeks of Itty Bitty’s life have gone. It truly seems like it was just yesterday that maternity leave stretched infinitely before me and I was never going to get to go back to work and I was going to lose my mind before the end. Don’t get me wrong – I am so very glad and grateful that I have been able to stay home with my babies for 12 weeks each time. I love not having to put them in daycare until they are a little bit older and sturdier. But I digress. This wasn’t actually supposed to be a foray onto my soapbox of “Staying at home with kids is really hard and those parents don’t get enough credit.” This is supposed to be a brief update on Itty Bitty and life in general with three amazing girls. 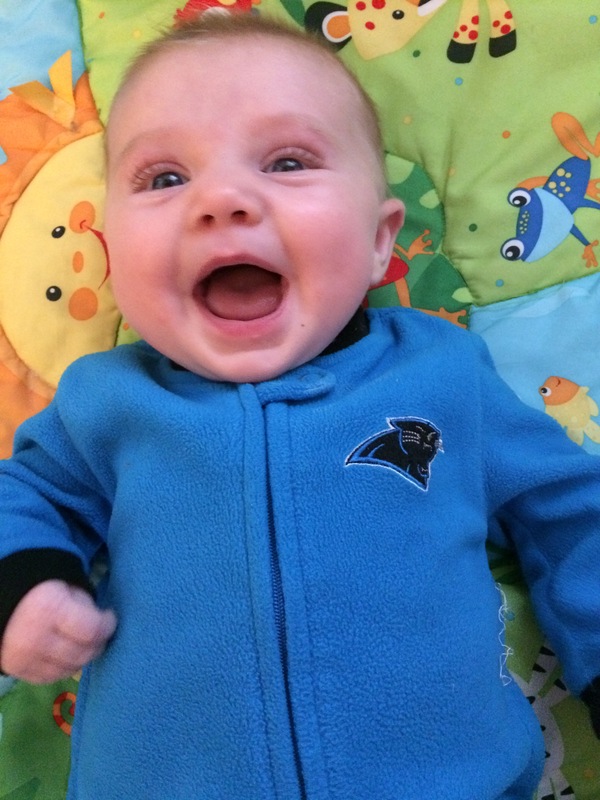 Itty Bitty is, without a doubt, the smiliest baby ever. She gets so incredibly excited anytime anyone comes and talks to her or interacts with her. She particularly adores the Littlest Brewster, a feeling that is mutual as LB thinks that her littlest sister is the bee’s knees. Itty Bitty is pretty laid back for the most part, cycling through eat, be awake for a bit, sleep for a bit most of the day without much crying or fussing. Like most babies, she gets pretty frotchety from 4:30 or so onward and doesn’t want to be put down; though as long as she’s being toted around or is on someone’s lap, she’s a happy camper. I feel like we have been exceedingly lax at trying to get her on a schedule re: naps and bedtimes. I need to go back and look at the monthly updates I did for LB and BIT (something you’ll notice I did not do for IBB) and see if they were on more of a schedule by now or if I’m misremembering. Granted, I know I haven’t really pushed the schedule issue because 1) with the bigger two being in school and having to get picked up and dropped off daily (I don’t do both but I do at least one or the other every day), Itty Bitty and I were rarely home for an entire day, 2) with the holidays and travel, it’s super difficult to maintain kids’ schedules and 3) I knew that whatever schedule I managed to get IBB on would go to pot as soon as she went to daycare. So I sort of went with the “sleep whenever you’re tired for as long as you feel the need” schedule during the day. Nights, we mostly try to do bath, bottle, bed between 6 and 7. She will typically be up once or twice a night and then up for the day between 6 and 7 in the morning. I’m usually pretty accepting of still being up with her during the night, though I get kind of frantic when she has the occasional “bad” night and is up more than that and I convince myself we are doing something wrong and she will never sleep through the night, ever, and I will never be well rested again, ever. Thankfully, she rarely has more than one difficult night in a row and I breathe a sigh of relief the next night, secure once more in the knowledge that we haven’t ruined her sleeping forever through our erroneous attempts at parenting. On the whole, I feel like life with three kids is going pretty well. It helps that the Littlest Brewster is now old enough to be sort of helpful and sort of autonomous. And both LB and BIT really love Itty Bitty and we’ve been blessed that there has been no actual anger or malicious jealousy over how much of my time and attention she gets. The DreadBrewer, while always an incredibly involved father, has started doing even more with the big girls (if possible), which has definitely helped with the transition. He does baths about half the week and bedtime most of the week for them. They love doing things with Daddy as he is definitely more fun and rough-house-y than Mommy is. (I just don’t play like that. I’ve tried and I can’t do it. I also have serious guilt issues that I can’t take care of everyone in the family all on my own but that’s just my own insecurities talking.) All in all, I feel like we’re settling into our groove as a family of five. Though I’m sure that will all go out the window when I go back to work next week and we have to establish a new routine all over again. 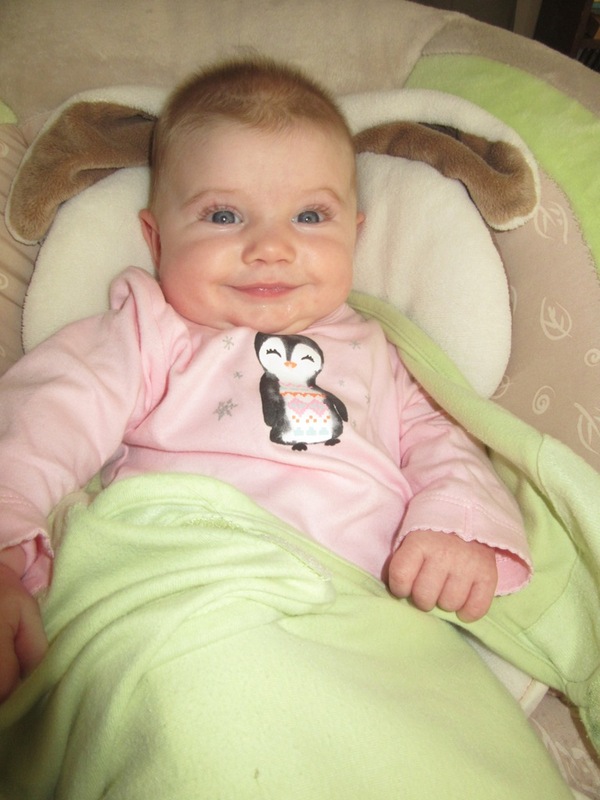 This entry was posted in Babies, Home Life and tagged BrewsterMama, Itty Bitty Brewster by BrewsterMama. Bookmark the permalink.